Can I Mission Briefing a Call to Mind? I recommand you to play Jace. 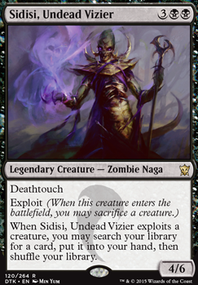 Wielder of Mysteries when war of the spark will be release en try de gain by milling yousleg instead of your opponent it will be more safe i think. It will also be faster because you draw a lot and this is going to mill you. 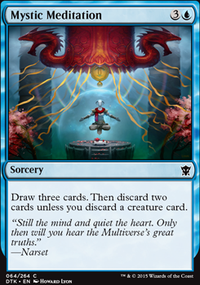 the probleme with the deck is that you need Psychic Corrosion to mill and without that only ashiok can mill a little, if you don't have luck you will never get Psychic Corrosion or get it to late to win. That's why i think milling yourself will be a better choice. With black color you can have acces to a lot of good card to protect yourself it can be interessting to go for a tricolor deck. I hope that i was able to help and sorry for my poor english. Mission Briefing is definitely not the worst swap, but its power is somewhat mediocre. 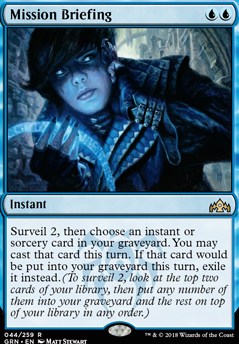 It does have some sweet synergy with top of the deck tutors where it allows you to surveil your tutored card in your graveyard and cast it with Briefing. Double UU makes the spell quite restrictive still. 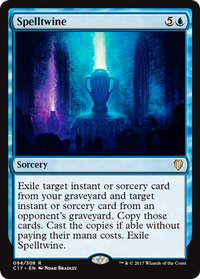 If you want a similar effect that is less mana intensive you could consider Jace, Vryn's Prodigy Flip. 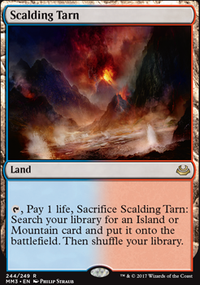 Muddle the Mixture could also be fine if you feel like you want more interaction that doubles as a tutor for Scepter and Grim Monolith combos. You have me nearly sold on Mission Briefing . 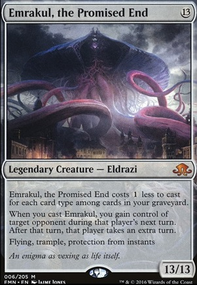 I personally save my blue mana for potential instant speed cantrips and counterspells we may draw with Rashmi's trigger. If single target graveyard hate is a serious problem, you should go for it! Counterspells work wonders on cards that extract. I'd rather answer with Misdirection than something that costs ≈ 7 mana. I'm gonna have to strongly disagree with removing Chrome Mox . A turn 2 Rashmi can give you such a huge lead by turn 4, and we run too few lands for Exploration . Couple of changes I made to rashmi. I cut Snapcaster Mage for Mission Briefing , added Search for Azcanta Flip, and started playing Nexus of Fate . I like the change of snap to mission because we have Faerie Macabre hate for Flash Protean Hulk and reanimator decks. Haven’t looked back. Search for Azcanta Flip has been amazing. Easy to flip, and almost never feels dead, unlike Rhystic Study . 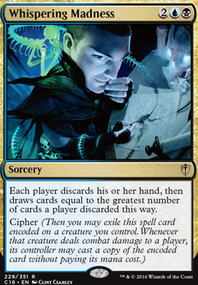 As for Nexus of Fate still have not been able to create the loop with Isochron Scepter and Mystical Tutor yet, so I don’t know if has its place yet. I also have been trying Exploration , and I am not certain about that one either.